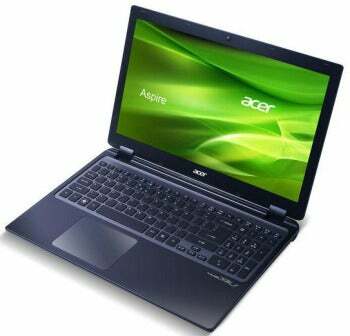 Acer launched one of the first 15-inch Ultrabook laptops to date, the Aspire Timeline Ultra M3, at CeBIT this week. The Timeline Ultra M3 offers several hardware features of mid-size mainstream laptops -- such as an optical drive, discrete graphics card, and large 15-inch display, but in a thin Ultrabook package. Weighing in at 2.3kg (5.07 pounds), the Timeline Ultra M3 is heavier than other Ultrabooks and competing ultrathin laptops -- namely, ones with “Air” in their name and that weigh under 3 pounds. Being a 15-inch laptop, however, the Timeline Ultra M3’s extra weight is understandable. For comparison, the 14-inch Samsung Series Ultra Ultrabook weighs 4 pounds and the Dell XPS 15z, which is not an Ultrabook, weighs 5.6 pounds. The M3 does hold up to the slim part of the Ultrabook ideal, measuring just 20mm (0.79 inches) thin. In that thin chassis, Acer manages to pack an optical drive, which is unusual for Ultrabooks these days (although both the Samsung Series Ultra and the Toshiba R830 Ultrabooks have DVD drives too). Alongside the DVD drive is a 500GB hybrid HDD, mixing a traditional hard drive for storing your files with a small solid state drive for faster booting. An SSD-only option will also be available. Besides the optical drive, another uncommon feature of the M3 is the dedicated Nvidia GeForce GT640M graphics card with 1GB of video memory. So far, the only other Ultrabooks that we know of that have dedicated graphics cards are the Gigabyte U2442 Ultrabooks, also announced at CeBIT. This addition is great news for gamers and, coupled with the DVD drive and large display, makes the M3 an attractive multimedia laptop. The display resolution on the 15.6 screen, however, is your typical 1366 by 768 pixels. Acer’s press release also claims the M3 will last eight hours on a battery charge -- which would be an incredible feat with the discrete graphics. We’ll have to see when the laptop lands in PCWorld’s labs. The Acer Aspire Timeline Ultra M3 is already selling in Singapore for US$1035 and is due to arrive for sale in the U.S. this month.